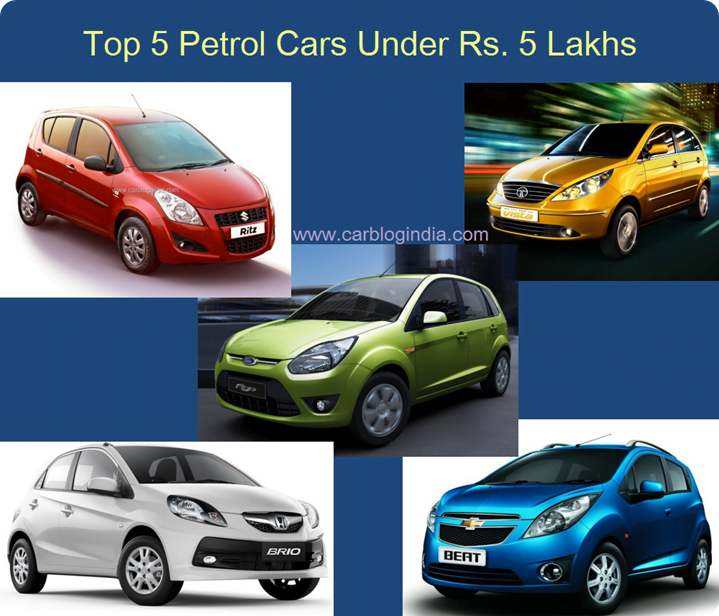 We have talked about the most affordable petrol small cars/ hatchbacks in our previous post on Top 5 Small Petrol Cars for First Time Buyers but we do know not all buyers would like to have the Nano or Alto as their very first car. The main reason is that they can spend some extra amount of money in order to avail better features and quality and for such readers we have this new post consisting of the best five cars that are a little pricier but are worth considering. In this article, we bring you the Top 5 Petrol cars in India Under Rs. 5 Lakh. Chevrolet Beat is the first car on our list as it is priced lower than its competition. The first and most attractive thing about the car is its killer pricing; between Rs.3.7 lakhs and Rs.5 lakhs. It is the cheapest in its class and is significantly better in terms of interior quality, comfort, and ride quality. The petrol model equips a 1.2 litre 4 cylinder DOHC unit that puts out a max power of 79.54 BHP at 6200 RPM and peak torque of 108 Nm at 4400 RPM. ARAI certified mileage figure for the Beat petrol is 18.6 KMPL which is quite good. What Chevrolet needs to improve in this car is rear seat comfort which lacks thigh support, height adjustable driver seat, small boot space. After the Beat, the next car worth considering is the Ford Figo. It may not offer the type of plastics quality that Beat offers, the ride quality is good and suspension is much stiffer which helps take demanding turns with ease. The car is priced between Rs.3.8 lakhs and Rs.5 lakhs. It comes with a 1.2 litre Duratec petrol engine which offers 70 BHP of max power at 6250 RPM and 102 Nm of peak torque at 4000 RPM. It returns an ARAI certified mileage of 15.6 KMPL. Interestingly there are no downsides of this car as such and it is considered to be one of the safest cars in its class(along with Beat). 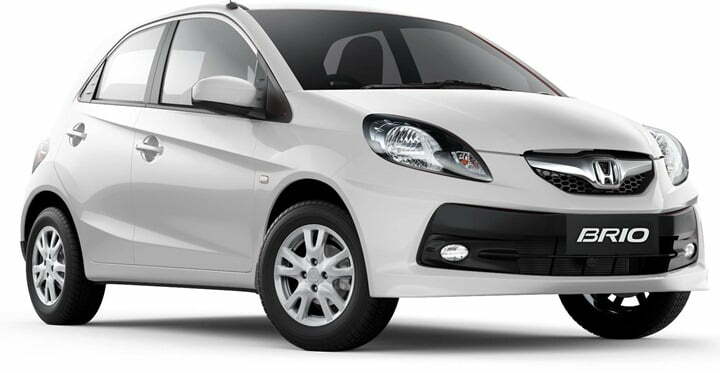 One of the most ambitious projects from Honda is the Honda Brio. It is a global car and despite the fact that it is offered in petrol only, it is doing pretty well in our country. If you love driving a car which smooth, comfortable and refined, then Brio is the car for you. It has probably the most refined engine in its class and the handling is great too. Interior quality is one area where we hardly complain, provided the manufacturer is Honda and the Brio is no exception. It offers great quality, fit & finish and a refreshing design. It is priced between Rs.4.05 lakhs and Rs.5.3 lakhs. The Brio is powered by a 1.2 litre i-VTEC engine that offers 86.8 BHP of power at 6000 RPM and 109 Nm of torque at 4600 RPM. The certified mileage of Brio is 18.4 KMPL. 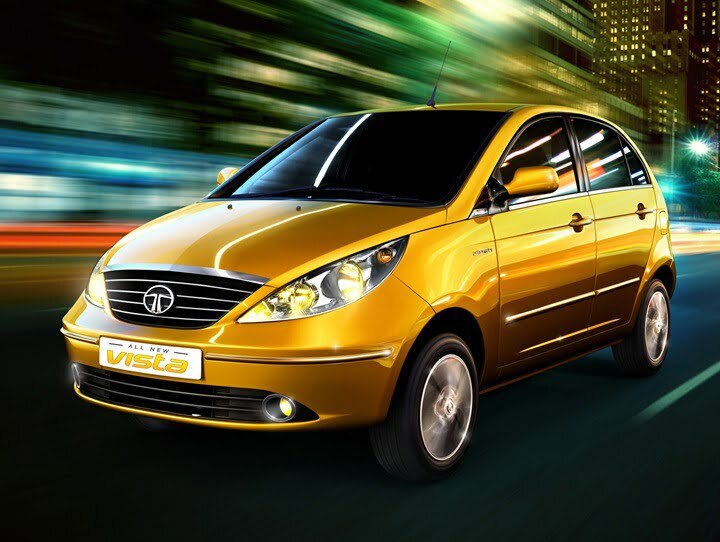 Tata Indica Vista is one great car at a great price. The design is pleasing, the interior has good features and great amount of space, the ride is comfortable, city driving is effortless. Some of the things not in favor of the car are body panel fit and finish, soft suspension, niggling issues, centrally mounted instrument cluster. The strongest point of the car is the cabin space where it even beats some of the sedans. It is priced between Rs.4.1 lakhs and Rs.6.5 lakhs. The petrol model is available in two engine options; Safire65 and Safire90. Safire65 delivers 64 BHP of power at 5500 RPM and 96 Nm of torque at 3000 RPM. The Safire90 offers 89 BHP of power at 6000 RPM and 116 Nm of torque at 4750 RPM. The Maruti Ritz diesel has recently been updated and need I says that, it looks great and we await the official launch of the petrol version. A lot of improvements are there on the car including the design, features, and mileage. Alike other Maruti cars its very practical, offers good interior package and handles well. The car is expected to be priced between Rs.4.8 lakhs and Rs.5.3 lakhs. It will be powered by a 1.2 litre 4 cylinder VVTi technology petrol engine which offers 86 BHP of max power at 6000 RPM and 114 Nm of torque at 4000 RPM. Fuel efficiency would be close to 18 KMPL. As we always say, all the cars have their own strong points and weak points. Beat is the cheapest and offers quality while the Figo is the safest and has good features and space. The Brio is the most refined and offers best in class interiors, while the Vista has the most spacious interiors but has lacks good quality. The facelifted Ritz petrol is yet to arrive and we are sure it will live up to its name. For us it could either be the Brio or the upcoming Ritz as the two cars which lead in this budget range. We recommend you to take a test drive of the cars if you are confused between two or more cars.